If you look towards the bottom of your form, you will notice that SharePoint automatically takes care of displaying the Created/Created By and the Modified/Modified By information for you. 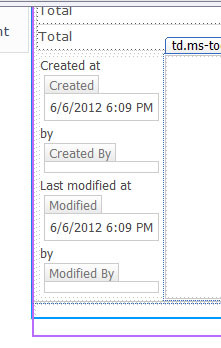 SharePoint automatically adds this information to the bottom of any form created. If you want to display the Modified field, you would replace Author with Editor since Editor is the internal name for Modified-remember to check out the links above to learn more about internal names. Or if you want to display both fields, you can just add another FormField control on the page and style it any way you want by adding HTML code between the CustomTemplate tags. One thing to keep in mind is that ControlMode needs to be set according to the type of form you are creating. In my example, I am modifying a display form so ControlMode is set to Display. If anything, you will learn just how the control bundles the information you see by default. The other night I was playing around with the dataform webpart, trying out different XSLT code to get a better grasp on it. Where I work, we are only allowed to use SharePoint Designer so I have had to spend a lot of time learning about the DataView webpart, and the more I learn, the more impressed I am. Now I am less inclined to jump straight into Visual Studio when developing SharePoint solutions. Anyway, I was playing around with a inventory cost list based on a spreadsheet I found online and I was trying using the format-number function in XSLT. Everything looked fine, until I noticed that cells containing values over a 1,000 were empty. I tried entering the function using the Formula button in the SharePoint Designer ribbon and noticed that values over 1,000 were turning up as NaN (or Not a Number). 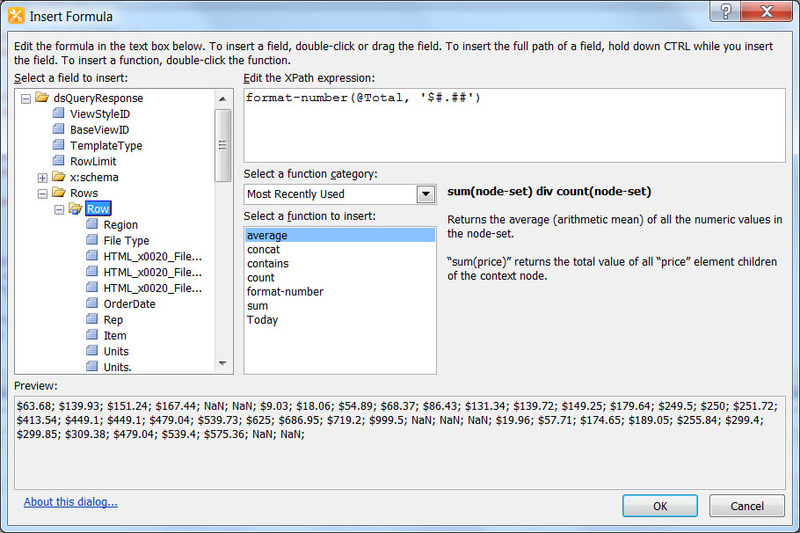 Values greater than 1,000 are not displayed when using format-number function in XSLT. Sure enough, values over 1,00o displayed correctly. Basically the translate function takes the first parameter, searches it for instances of the second parameter, and replaces it with the third parameter. In my case, it took the Total value and replaced the comma with nothing before processing. The format-pattern in the format-number function adds back the comma in the proper place. The other thing you will notice is that I replaced the place-holders after the period from # to 0. When it was set to #, I notice that values that ended in zero were truncated. For example, 60.00 would be turned to $60, or 49.90 would become $49.9, but 59.09 would display as $59.09. The # place-holder displays 0 as absent when it starts or ends the number and that is why some numbers were correct while others were truncated. If you have encountered this issue, share how you solved it below.